eTravelSmart offers a wide range of travel solutions to empower travel agencies and suppliers with the right solutions and facilitate our clients with the right tools to help them provide an enhanced travel booking experience to their customers. Under one roof we provide a plethora of travel services to our clients, travel consolidators, travel suppliers, independent hotels and car rentals. Our travel booking software will help you in distributing your products online and controlling your business too. We are truly a global travel technology provider offering online travel solutions through B2B travel portal that allows complete automation of travel companies in a cost-effective manner. We understand the essence of travel industry and deliver solutions that simplify the business processes of small to large travel agencies. Through this B2B travel portal currently we offer you the best competitive rates, deals or commission on all major modes of transport and have been devised to provide maximum content in the easiest possible method so that when someone is buying ticket online your business is not left out. Our B2B is an extremely dynamic travel system that powers you with maximum travel services and maximum functionality. We offer discounted air fares from India and within India with lowest available fares & tariffs, enabling agents to earn large commissions and with option to add their own markups. We provide scalability to your travel business from start-up to a full-fledged travel agency and so on. Information of operators and amenities provided by them will be part of the	new upcoming feature. Dedicated team is working on collecting relevant information at bus service level in different routes. As we have successfully integrated all major API's into our platform and considering the issues/technical challenges we experienced, following points will enable seamless integration experience with us. Mock testing for service cancel is done & client can verify his audit. Contact Number:+91- 86888 34567 . Online bus bookings have witnessed a huge spurt since January 2013, registering a growth of 185%. While the number of online bus bookings were 0.25 million in January, July recorded 0.72 million bookings. 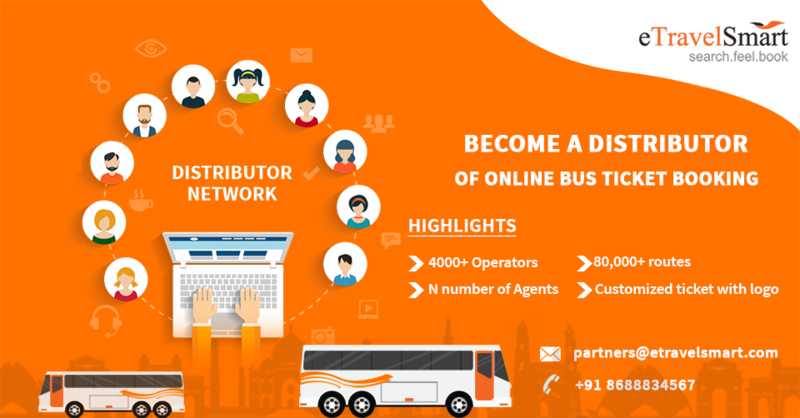 As Online BUS booking is picking up on high volumes these days, here is your best opportunity to start your own Online BUS booking website with minimum cost and competitive features. This industry is been untouched for several years and now all the BIG travel players are launching their services to grab the increasing market share. 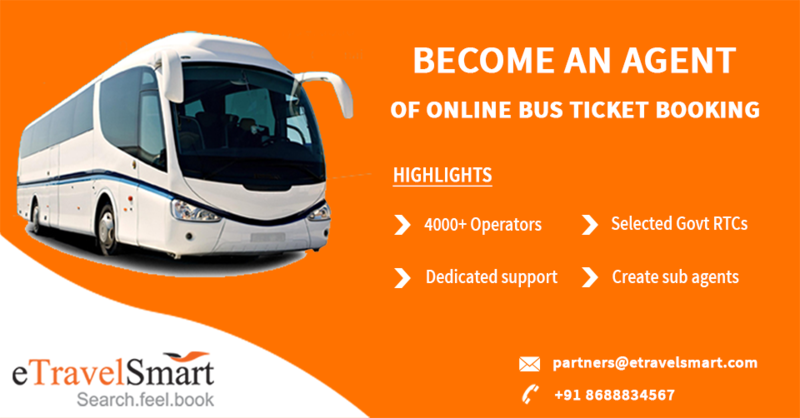 The cutting edge technology @ eTravelSmart enables you to have a customized website on your own name/your own company name powered by real-time online BUS booking. This feature allows you the freedom to retain your identity through our White Labeling Solution. This opportunity supports our Travel Affiliates by providing tailor-fit solutions enabling to run their businesses in the most competitive manner. Our system handled all the way, incase of service cancel either auto refund money and update the ticket status as service cancel, issue cash coupon, arrange a offline ticket and stopping refund etc. Where ever required payment details we have implemented all, like auto refunds, get the payment details, payment at booking time, insurance after booking, for partners like agents, distributors instant recharge etc..
For cancel ticket since vendor does not have auto cancel process we are doing offline with the help of system auto generated emails about cancel request for insurance. For all above partners will have beautiful dash board, recharge options (including Payment gateway), booking ,payment, subagent/distributor agent reports, balance alert, booking alert, all sms and email whatever we have and also logo upload options, address upload, these logo and address will go to eTicket and address and agency name will go to mTicket SMS many more options. Whatever we have everything will be provided and client can configure the pricing of all loginfee . BTM (Booking Tracking Module): CC Team will be keep monitoring each operations done by online customers and our system will populate the required records to claim and cc team will claim the record and they are responsible to close the record. Example: Customer try to book the ticket and he went to payment gateway page and not doing payment, immediately that record will be claimed by only one CC team person and he will call and help customer. Example: Let's say customer trying book the seat but payment was failed from payment gateway, but customers will get sms from their bank saying that amount was deducted, here our cc team can view the actual what happened and immediately explain to customer with the proof also and send email or sms also in detail etc. We developed fully automated system to clear any type of issues from customer side or from operator side or internally etc. Admin application has great features like salient refunds to customers without login to payment gateway ( For online customers and for agents, distributors all parties incase of service cancel or any auto refund failures from system. Comments also default login information about who is updating. Once recharge done automatic emails and sms will go to partners about the details and including current balance also. We can maintain more than 4000 direct operators or api also even we should keep recharge to them and monitor at our side how much balance as per our bookings or cancel etc. with this module we can make sure our balance recharge money utilizing properly. We should believe our technology and never depends on third party. Contact person details like technical, recharge update, refunds, service cancel etc..
We can update any partner plans or commissions individually based on requirement. Update the plans and activation fee also etc. Since our all third party giving junk locations and spelling changes and no control on them, so we developed a module that will be having invalid , valid location lists that map should be very critical for entire application. Example: One operator given Vishakapatanam id as 4, other visakapatanam given 234, some other visakhapatanam given 765 , all location names are correct but spellings are different with respective operators but we should get all operator data and API Data even customer selected one location name and we should not show all these locations to customers, so manual team require to automate entire process. Our dedicate team keep building Our own list with mapping all, removing list of junk. If we have multiple api's if we want one particular bus operator does not come from particular api even though more commission, these kind of configuration we can do here. Daily house keeping activities and health checks. Our SAAS (Software As A Service) model allows you to start your own online BUS booking portal with minimal cost,less time and competitive features. So here is your best opportunity to enter the growing bus industry and to grab the increasing market share. TDS - Tax Decuted at Source. Becoming an agent @ eTravelSmart is simple & easy. By registering as an agent, you will experience the all new features which will make your job simple without constant personal intervention. 1. My Profile: This feature allows to access/update your complete information at any time. Also you will have an option to upload your won logo. This information i.e. Agency Information & Logo will be displayed in the eTicket of the customer and the SMS sent to customer will also have your Name & Contact info. This will help in creating your own brand with customers through eTravelSmart. 2. Search/Cancel: Just by using the operator/ETS PNR number, you will be able to search for bookings and if required cancel them with just 1 simple step. Instant Recharge: Recharge instantly by using Debit/Credit cards or through Net Banking. Cash/Cheque Deposit/Online Transfer: Deposit cash /cheque or initiate an online transfer in our account or through your nearest bank branch and just send across a confirmation details. Once we receive the credit, your balance will be immediately updated. 4. Payment Report: This feature allows you to refer to the past payments made at any time. 5. Booking/Cancellation Report: Booking/Cancellation report is a comprehensive option that will empower you to look at all the bookings/cancellations made for a particular period. This will enable you to have better track of all bookings/cancellations made either by you or by your sub-agents with complete information on commissions, etc. 6. Change Password: eTravelSmart ensures high level of security and you can ensure better security by changing password at any time. Once you become an agent @ eTravelSmart, you will have the unique option of creating sub-agents on whom you will have full control. Even if you have multiple booking locations/multiple people working under you, you can create separate logins for enabling bookings through them. Any booking done by your sub-agents, you will receive notification through SMS and all their bookings can be viewed in the Booking Reports option/in Dashboard for better understanding. As like agents, sub-agents can also have their Contact Information which will be displayed in customers eTicket and also SMS received by customers will also have this information. Sub-Agents can also have accessibility to search/cancel and booking/cancellation report options. Being a Distributor @ eTravelSmart, you can create your own network of agents across India. This is a unique model which will enable creation of any number of agents with designated commission rates and agent balance management. In this model, the Distributor has the unique advantage of earning commission on his agent's bookings. 1. My Profile: This feature allows to access/update your complete information at any time. Also you will have an option to upload your won logo. This information i.e. Distributor Information & Logo will be displayed in the eTicket of the customer and the SMS sent to customer will also have your Name & Contact info. This will help in creating your own brand with customers through eTravelSmart. 5. Booking/Cancellation Report: Booking/Cancellation report is a comprehensive option that will empower you to look at all the bookings/cancellations made for a particular period. This will enable you to have better track of all bookings/cancellations made by you. In this option, you will also be able to see the bookings done by your agents. As a distributor agent you will have all benefits of maintaining profile information, Booking/Cancel, Payment Report to Distributor, Commission Reports, etc. The Profile information option will enable you to update your own information and also uploading your logo. Your information & logo will be displayed on customer's eTicket and also in the SMS sent to the customers for the bookings made by/through you thereby creating your own brand with customers through eTravelSmart.